esp. the chorus raised on drawing close to the hunted quarry. ME. unable to flee further, it turns and defends itself at close quarters. Freq. fig. Only in at bay, to bay, at a bay (obsolete), to a bay (obsolete). ME. The bay of dogs is a familiar sound and, for anyone that's ever been pursued by a baying pack, a truly terrifying one. 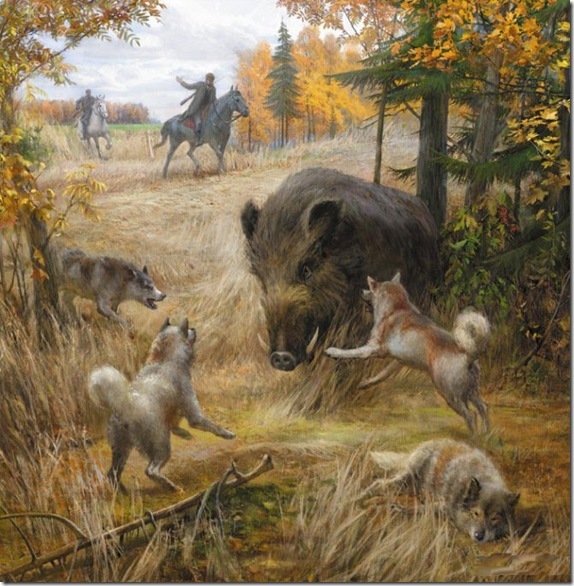 Bay as the noun for the defensive position is much less well-known, even though the posture itself is instantly recognisable, as illustrated by the cornered boar in the painting. The use of bay seems somewhat contradictory though. If you hold someone (or something) at bay (a very common expression in English), you keep it at a distance, most likely because you see it as a threat or are at the very least suspicious of its intentions. An animal at bay, however, according to all of the references I've found, has taken up the bay position of making its last stand (which is clearly contradictory to the modern English meaning). Some online references suggest that holding at bay refers to Definition (1) in that you're holding an aggressor in a position where it is still baying (barking), rather than being able to move in for the kill. It could also be possible that the meaning of holding at bay has been changed in its modern meaning, and rather than meaning it's being held at bay (i.e cornered into the defensive posture), it now means as suggested above (being held off from making its ultimate attack). Please feel free to comment, make suggestions or link to any authorities that might be able to make this clearer than I can. In finding a picture for this post, I had to go through quite a number of disturbing hunting pictures (although numerous Megan Fox pictures helped mitigate this). The painting above was the best I found for showing an animal at bay, but I couldn't identify the artist. If anyone knows, please do tell. Possibly Vadim Gorbatov, although my Slavic Art repertoire is sadly depleted due to disuse. Also found this, while up a ladder, supposedly cleaning a window, irritatingly bound by curiosity fired by your post, to the consternation of the freshly-showered pensioner beyond the window, staring at the camera phone in my hand, holding up her towel with all the strength her rheumatism will allow. If I'm arrested the least you can do is bail me out. Good research Clueless, though I'm wondering if I need to start posting a disclaimer on the blog: Not to be read, thought about, researched or otherwise considered while up a ladder or otherwise engaged in dangerous activities (especially considering your earlier threat of barratry). I like your description and also the illustration you used. Very fine. Thank you! So my OED says that "the phrase to hold at bay seems adapted from the Old French 'tenir a bay', where 'bay' means the state of suspense, expectation, or unfulfilled desire, indicated by the open mouth (late Latin 'badare', to open the mouth); but 'to stand at bay', 'be brought to bay', correspond to modern French 'être aux abois', meaning to be at close quarters with the barking dogs, and bay is here aphetically formed from 'abay', an adoption of the Old French 'abai', barking."